In the center of Tulln several individual monuments of the fortification system of the auxiliary fort are preserved including the earlier east gate in the Marc-Aurel-Park, the so-called “Salt-tower”, a late Roman U-shaped tower an the western curtain wall close to the bank of the Danube and the foundations of another fan-shaped tower in the southeast corner of the fort located at the Hauptschule. 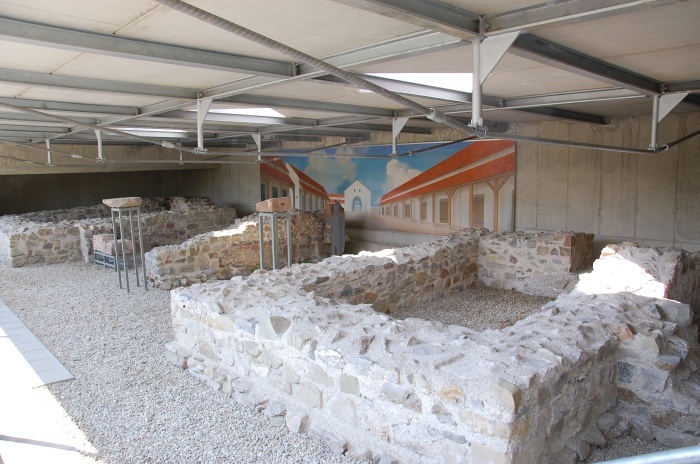 The Roman museum hosts a fine collection of stone monuments, metal finds and pottery from Tulln and various find spots in the region. The most prominent attractions are the Trajanic building inscription and the impressive remains of the preserved eastern fort gate. The Roman fort was located between the mouths of the Große and Kleine Tulln rivers in a wide plain called the Tullner Becken. The north part of the fort has been swept away by flooding of the River Danube. Several construction phases reveal that the fort, begun in the Flavian period, was used up into Late Antiquity. During the Flavian period an earth-and-timber construction was built. In 104 AD it was re-built with stone. The porta principalis dextra, which is preserved and included in the museum display is a remnant from the oldest building phase. Two fires in the 3rd century have been determined. Two late-antique towers have been preserved as ancient monuments: the fan-shaped tower and the “Salt-tower”. Around 400 AD, the fort was destroyed and became the site of a civilian settlement until the end of antiquity. It is assumed that the area was re-settled in the late 8th century. Finds from a vicus have been excavated to the west and south of the fort. Late-antique cemeteries have been found in the south and southwest. The earlier cemeteries lay along a road in the west.